Immigration is a controversial topic in the United States. Some politicians see refugees as a threat to national security, while others categorize them as individuals in need of assistance. Today, television and computer screens are filled with leaders and their emotionally charged opinions on the subject. Last week, Thurston Middle School eighth graders had the opportunity to become familiar with the issue of immigration on a personal level. 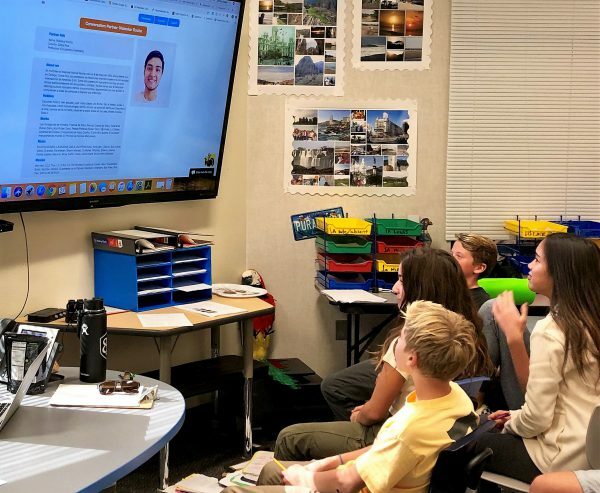 While honing their language skills with a long-distance pen pal, the middle schoolers discovered that they were talking to a Central American refugee. Students in Jeffrey Dippel’s 1B Spanish class engage with native Spanish speakers through an interactive website called talkabroad.com. During their recent studies of Nicaraguan culture, the youngsters had a video chat with a man named Allan M.
Allan spent 18 years living in Managua, Nicaragua. He has regularly spoken with Laguna middle schoolers and shared his love for. This year, however, Allan said the country’s political and social turmoil became overwhelming. “They have tortured, burned down, shoot, murder, and kidnaped [sic] the youth of Nicaragua,” Allan wrote about the Nicaraguan leaders. He said that after more than 500 people were killed, he and his friend felt unsafe and had to leave the country. He traveled with his friend to Foligno, a small city in the center of Italy where he is currently being hosted by his friend’s parents. According to Dippel, Allan revealed his refugee status in a conversation with students just before the Thanksgiving break. “Allan explained that the government is corrupt and cruel, but here, it is completely different,” Ghere said. Kind of sounds like one school teacher has figured out how to politicize the government school classroom, and indoctrinate our children into becoming future Democrats, who will be trained to refer to illegal aliens as simply being “undocumented”.